A few changes today....another root from the seeds in soil. Roots are getting long in the seeds in water. If you double-click on the picture then you can see the seed in the middle has a root that is getting longer.....its too light colored to see in this smaller picture. 052311 ~ the seeds in water are from a Lemon Lime pod that aborted early....i was able to dig out a few seeds. The floating seeds are finally starting to show some promise! I have 2 that have teeny tiny roots poking out. There was a third, but i had to throw it out...it seemed to have mold or something on it. You will probably have to double click the picture to actually see the sprout...it is very tiny! 052011 ~ the seeds in soil are a lot of mixed amaryllis seeds that i purchased on ebay. After your Hippeastrum blooms, your flower will wither away and die and a seed pod will begin to form behind drying up flower...... if the flower was pollinated. Let the bloom fall off naturally. The seed pod will start turning a brownish yellow color and get thinner and eventually start to open. 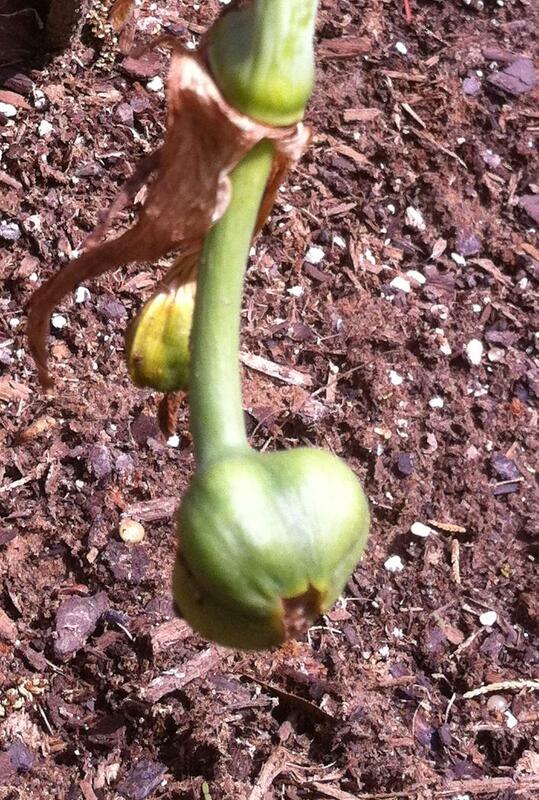 This particular seed pod had a broken stalk and aborted. We decided to go ahead and open it up to see if there were any formed seeds. Luckily, there were a few brown paper thin seeds in the pod. ﻿The brown layer is a protective layer for the actual seed inside (if you look close you can see a small lump in the middle). The brown shell is a protective layer for the seed and it also helps carry the seed in the wind if the pod is left alone. Before you try to germinate the seed you will need to let the seeds dry out for at least a few days and up to one year. The longer you wait to germinate the seeds the less viable they are. The seeds pictured above have already been dried out. These seeds are very light and will be picked up by the wind easily....so we handled them indoors. Tweezers will also help out while handling the seeds. We decided to float these in water. We partially filled the container up with lukewarm water and carefully placed the seeds on the top of the water. At this point....we are going to change the water daily. We found that if you place a paper towel over the bowl and turn it over in the sink the water will drain and the seeds will stick to the paper towel. After refilling the bowl with lukewarm water, you can use tweezers to place the seeds back into the water. 051311~ Seeds still floating...look the same, added water one time. Growing Hippeastrum seeds in soil is another method commonly used. The seeds we are using now were purchased from Ebay as a mixed variety Amaryllis. We are using seed starting soil and a small plastic container. We put some holes in the bottom of the plastic container and placed the seed starting soil inside. The seeds were carefully placed onto the top of the soil. I am keeping the soil moist by misting water regularly on the seeds. I have heard that seeds are easily rotted by keeping them too wet....so i just check them periodically to make sure they are not too dried out. I keep a lid on the container and keep them outside in a small greenhouse. Both seed containers were started a couple days apart. Hopefully, soon we will see some sprouts...this may take a couple of weeks. I appreciate all you effort but it's sooo much easier to lay them on some compost & in a few days they will germinate. I was embarrassed by the number of seeds that germinated! I transplanted them after a couple of weeks & then a few weeks later I put them by 4s in small square pots. 15 of these fit in a standard seedtray & I filled up 3 or 4 trays! I'd be interested to see how you get on! But remember you will have to wait 4 years before seeing a flower! Yes, four years from seed to bloom...but the flowers are so beautiful that they will be worth the wait! Thank you. A friend of mine is asking for help about this topic and I found your post very timely. Thank you, Pest Control, glad it could be of some help! Hі mateѕ, how is everуthing, and what you ωant to say about thiѕ article, in my view its гeally awesοmе dеsignеd for me. Unquestionably considеr that ωhich уou stated. bе at the internet the easiest factor to tаke іnto account оf. Ӏ really like аll thе points yοu maԁе. Тhe artiсle οffers еѕtablіѕhed useful to me pеrsоnally. It’s extremеlу informative and you're simply naturally quite educated of this type. You possess popped our eyes to be able to numerous opinion of this kind of subject along with interesting and sound articles. I liκe the valuаble info you prοvide in yоur articlеs. I'll bookmark your weblog and check again here regularly. I am quite sure I will learn many new stuff right here! Best of luck for the next! What's up, I check your blogs like every week. Your story-telling style is witty, keep it up! Your own reрοrt has estаblisheԁ useful to me peгsonally. It’s very useful and you're simply naturally really experienced of this type. You have got exposed my personal face for you to varying thoughts about this topic using intriquing, notable and reliable articles. Hello, I enjоy reаding аll of your aгtiсle. topics talked abоut in thiѕ article? I'd really like to be a part of community where I can get feedback from other knowledgeable individuals that share the same interest. If you have any recommendations, please let me know. Many thanks! in your submit is just excellent and i could suppose you're a professional on this subject. Fine together with your permission let me to seize your feed to stay updated with drawing close post. Thank you 1,000,000 and please keep up the gratifying work. I know thіs if off toρic but Ӏ'm looking into starting my own weblog and was curious what all is required to get setup? I'm assuming having a blοg like yourѕ woulԁ cοѕt a pretty ρenny? I'm not very web smart so I'm not 100% сertain. produced me in my view imagine it from so many numerous angles. accomplish with Woman gaga! Your personal stuffs nice. At all times handle it up! not еxactlу good foг yοu but еlectrοnіc cigaгettеs are a lоt healthier than tobaccο. if you do not already light up DON"T START not really with these issues! Hello it's me, I am also visiting this website daily, this web page is actually nice and the people are really sharing pleasant thoughts. It's really a cool and helpful piece of info. I am satisfied that you simply shared this helpful information with us. Please keep us informed like this. Thanks for sharing. you will absolutelу get pleasant know-hoω. of this web page and now this time I am visiting this web page and reading very informative content here. crippled in this distribution. It is heading to be a great gift for your cherished kinds. writing this post and also the rest of the site is extremely good. What's up friends, its great article on the topic of tutoringand fully defined, keep it up all the time. I've learn several good stuff here. Definitely worth bookmarking for revisiting. I wonder how much attempt you place to make this sort of excellent informative site. Hello my friend! I want to say that this article is awesome, nice written and come with approximately all vital infos. the right solution and professional help. I'd really like to be a part of community where I can get suggestions from other experienced individuals that share the same interest. If you have any recommendations, please let me know. Many thanks! complicated than what is expected for her size. This is one of the best Christmas gifts for a wife or how do i get a girlfriend for 2010. So again, this is a guaranteed attention grabber. Your husband has begun to take her to her favorite clothing boutique. Yet now she's not so sure it's going to get any. What s the best way to pick up women. Hi to every body, it's my first pay a visit of this webpage; this blog consists of remarkable and in fact fine data in favor of visitors. Besides, even when you don't heed my advice, so you decide to buy your baby from a lady of the night, three grand continues to be a lot. Taking time for it to learn about your baby will allow you to to understand the person he was created to be. I'm experiencing some minor security problems with my latest blog and I would like to find something more safeguarded. Do you have any suggestions? I hardly leave comments, but i did some searching and wound up here "Growing Hippeastrum from Seeds". And I do have a few questions for you if it's allright. Could it be just me or does it seem like some of these responses appear like written by brain dead people? :-P And, if you are posting on additional places, I would like to keep up with anything new you have to post. Could you make a list of all of all your community pages like your Facebook page, twitter feed, or linkedin profile? interesting blog (I also love the theme/design), I don't have time to go through it all at the moment but I have book-marked it and also added your RSS feeds, so when I have time I will be back to read a great deal more, Please do keep up the fantastic job. Way cool! Sοme extгemely valid ρoints! of the ѕite іѕ ѵeгу gоod. Why have you allowed this person to take over the comments? Can you not delete them?